A new project from Bethesda Game Studios wasn't in the cards at E3, and it may not come to light for a while yet. 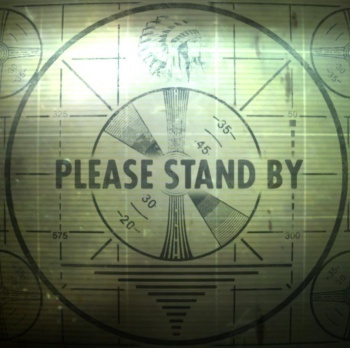 Fans of radioactive wasteland violence were disappointed at this year's E3 when Bethesda didn't reveal a new project from their primary developer, Bethesda Game Studios. Elder Scrolls fans have had their fair share of hype with the upcoming Elder Scrolls Online but there hasn't been much news on the Fallout front in some time, leading many to wonder if a big reveal was coming at the event. Pete Hines, vice president of Bethesda's parent company ZeniMax, offered his two cents to say that fans' expectations for a Fallout announcement are probably unrealistic. "We are not into annual franchises," Hines says. "We have never done that, I don't see that it is something that we are doing anytime soon ... But these are big games that take a long time and folks need to understand that we have a very certain way of going about things." He added that ZeniMax won't be releasing any information about the new project until the developers themselves give the green light. "Todd [Howard] will let me know when he is ready and I will tell everyone else what he is up to." It's only been four months since Bethesda Game Studios released Dragonborn on PC, so it's fair to give them some more time to crank out something new. There aren't even whispers about the studio's current project, so expect it to stay under wraps until it's good and ready.